Quick! What’s the difference between a poncho and a cape? And which do you think the garment above is? When I think of a poncho, I picture a large piece of fabric with an opening in the center for the head. I also think of it as a garment traditionally worn Native North and South Americans. Whereas, a cape is a garment that wraps around the body, opens down the front and fastens at the neck. I equate the cape with European culture (think: Musketeers and Matadors). So which is the outer garment above? It has an opening for the head like a poncho, but the side slits and even hem remind me of a cape. The clothing company calls it a cashmere cape. Is that what you guessed? Apparently, the fashion world is less concerned with the finer points of ponchos vs. capes, and more concerned with creating unique outwear. The result is often a lovely hybrid of the two garments. WHY A PONCHO OR CAPE? Ponchos and capes are great choice for true fall weather--those not-too-hot-and-not-too-cold days, when you need something cozy warm, but aren't ready for a heavy winter coat. 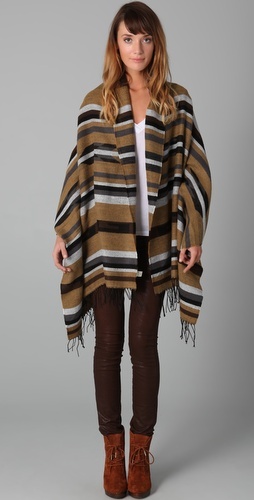 The right poncho or cape gives the over 50 woman loads of style without a lot of effort. You can throw a poncho or cape over just about anything, and be out the door. Who knows what lurks beneath that poncho. A ratty T-shirt? A pajama top, perhaps? 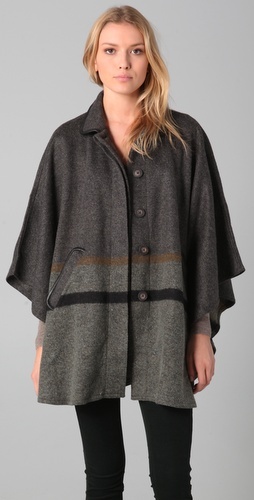 Here's another garment that defies the traditional definition of a poncho. I love the cowl neck. The last thing I want is a poncho that looks like a tent or mushroom cap. Instead, I like the knitted ponchos and capes that drape over the body, hanging close to the frame. I also gravitate towards a garment with a pointy hem rather than a straight hem all around. A long hem point in front makes my silhouette look longer, slimmer. 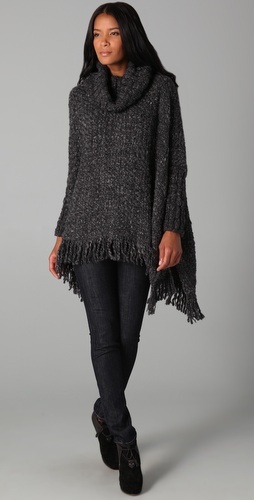 A stylish fall poncho or cape like the one below can take you from the Saturday afternoon football game to dinner with friends at a nice restaurant. And don’t forget the bulk distribution rule: If the garment you wear on top is bulky or loose, keep your bottom-half structured. 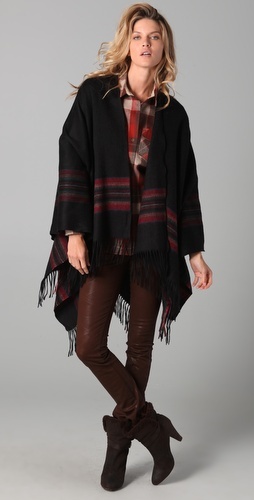 In other words, a loose poncho or cape should be paired with a straight skirt, straight pants or jeans, or leggings. Not convinced that a poncho or cape is right for you? You might want to experiment with a reasonably-priced, pretty shawl first. Unlike a poncho and cape, which are hands-free, you might have to adjust the shawl now and then to keep it from falling off your shoulders. Still, it's a cozy, stylish alternative.